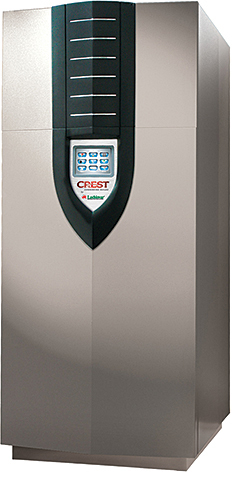 The Crest® features fire-tube technology integrated with the Smart Touch™ operating control system. The boiler features a low-nitrogen-oxide combustion system with a stainless-steel heat exchanger and a dual-system burner design with up to 25:1 turndown. The top-mounted, micro-metal fiber burner serves as two combustion systems in one, each with its own blower and gas-valve assembly to power the combustion process based on demand.